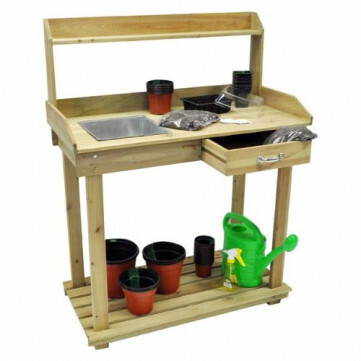 The Kingfisher Potting Table is strongly constructed of tanalised timber and is ideal for greenhouses and sheds. It has a large working surface that features a 10" 10" x 3" Deep steel inset tray, ideal for your potting compost. A handy compartment draw and robust shelving finish off the potting table superbly. The potting table is 3ft Wide and 18" Deep, the main bench is 32" High, and with the Upper Shelf attached the unit measures 47" High. Please note that it is possible to not add the upper shelf or the two uprights that support it, if not required.